Papergreat: Book cover: "The Last Hope of Earth"
Book cover: "The Last Hope of Earth"
First sentence: It seemed to Benbow that the mist had been around him forever. Last sentence: He shivered despite the humidity and moved back towards the brightness of the open door. Random excerpt from middle: A long range survey jet reported dark, bare rocks on Greenland — the first time in thousands of years that they had not been covered by snow and ice. Through gaps in the mists the red flames turned the icy north into a hellish, volcanic land of chaos and destruction. From England there was nothing. 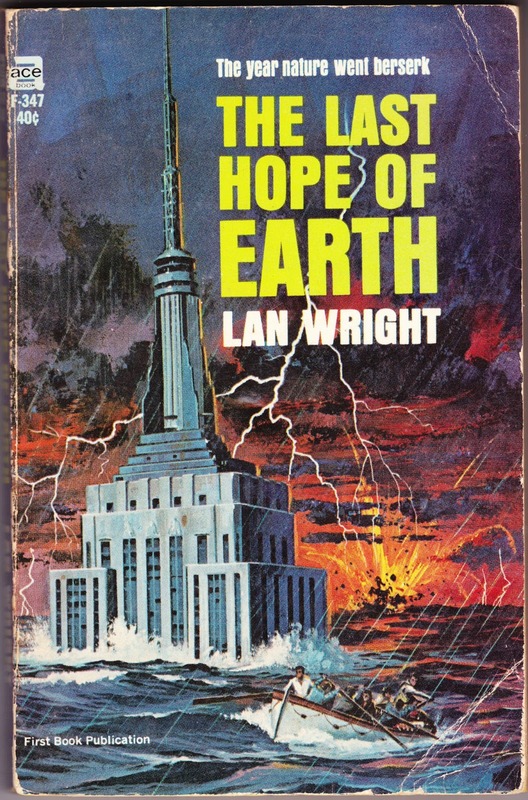 Notes: SPOILER ALERT: According to the back cover and the blurb at the front of the book, Earth's last hope is Mars: "Man's only hope lay on Mars, where a colony of the world's best scientific minds was working on a project to save the human race." ... This seems like an appropriate choice for a post during a week filled with news about President Obama's continued focus on climate change; intriguing new signals from a star 94 light-years from Earth; the discovery of a potentially Earth-like planet just 4.2 light-years away; the emergence of a tropical storm named Hermine that could hit northern Florida as a hurricane and then soak the Atlantic Coast; and the dispiriting news that we're probably stuck on Earth, because we're having more and more difficulty getting rockets safely off the ground. ... This book has a stamp on the inside front cover for THE BOOK RETRIEVER, which sold used books and stamps in McMinnville, Oregon, the birthplace of Beverly Cleary. According to an online obituary for Roger E. Williams (1946-2013), Roger and Eleanor Williams and Randy and Chris Trudo "opened The Book Retriever, a used book store in downtown McMinnville. While there [Roger] made many friends and enjoyed those who just stopped by to chat." ... This book was also published under the title The Creeping Shroud, with an even cooler cover.